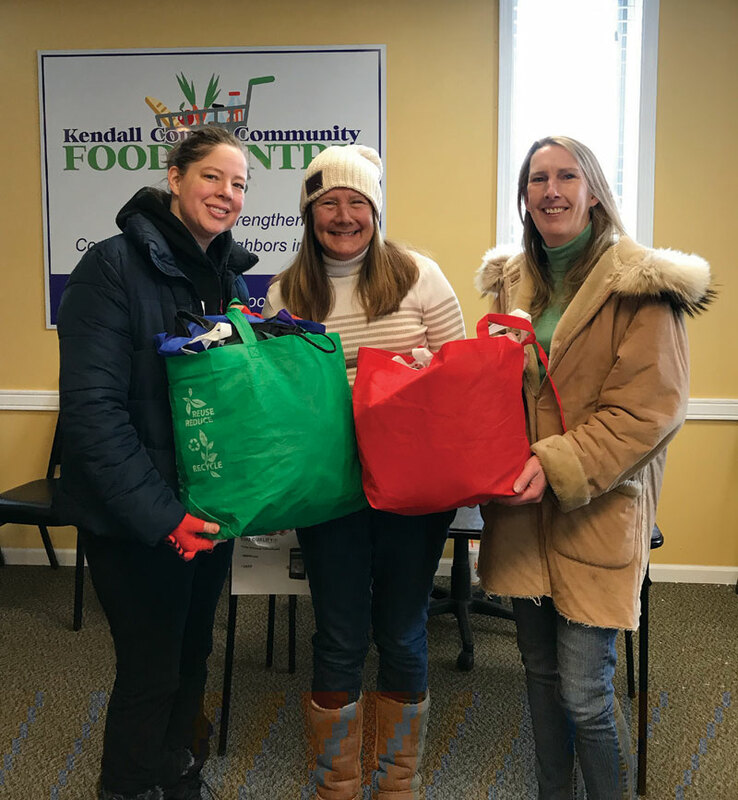 Sandra Hurtado of Harmony Aesthetics, left; Stephanie Roskopf of Yorkville Auto Body Shop and chairman of Green Connect, right; present Cathy Kavanaugh, volunteer at the Kendall County Community Food Pantry, with more than 500 reusable bags for use of Food Pantry patrons. Green Connect, which meets the second Thursday of each month at 11 a.m. at the Chamber office, 26 W. Countryside Pkwy., “aims to educate, promote and encourage businesses within the Yorkville area to enhance the community environment by participating in sustainable ecological practices,” according to its website. Membership in the group is open to Chamber members and the public. Roskopf, who is chairman of Green Connect, said that the committee members want to collect 5,000 reusable cloth bags to donate to the Food Pantry to replace plastic and paper bags currently being donated for use.The Pantry estimates it uses 1,000 such bags a week.People who would like to donate reusable bags can drop them off at FNBC Bank and Trust, Kendall Printing, Rosati’s Pizza Pub, Sense of Samadhi, Yorkville Auto Body and at the Yorkville High School. For more information on Green Connect, read here or call the Chamber office at 630-553-6853.